Ford E-Series has been America 's most versatile van for more than 40 years and America 's best-selling full-size van for 26 years running. Since its introduction in the fall of 1960 as a 1961 model, more than 6 million E-Series vehicles have been built. E-Series has set a segment standard since 1979. This year, Ford will outfit its 12- and 15-passenger extended-length vans with the exclusive AdvanceTrac with Roll Stability Control technology. Únlike any other system, Roll Stability Control features roll-rate sensing and correcting capability, offering assistance to the driver in maintaining vehicle control during extreme maneuvers. The system automatically engages counter measures to help the driver maintain maximum control and further reduce the risk of rollover. 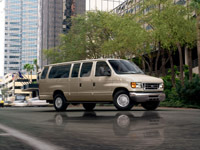 The E-Series models include a Commercial Van, Recreational Van and an XL, XLT and Chateau Wagon. Van and cutaway/stripped chassis models have the strength and durability for a variety of commercial jobs, while the wagon offers room for family utility. The E-Series is assembled in Lorain , Ohio . The E-Series has aerodynamic styling that complements its image as a hard-working vehicle. Wraparound bumpers help protect front-end sheet metal in minor impacts. A light charcoal bumper is standard on the Commercial Van and XL Wagon. A chrome bumper is standard on the Recreational Van and XLT Wagon. Available packages include an Exterior Úpgrade Package, RV Plus Package, Motorhome Prep Package and a Shuttle Bus Prep Package. The E-Series cargo area is a double-well design – a full-size Van exclusive – which leaves the exterior sheet metal less vulnerable to damage from shifting cargo. E-Series also offers ambulance prep, interior upgrade and Crew Van packages. The E-Series Van and Wagon are available in regular- and extended-length models. Also available is a cutaway version and a stripped chassis version, each with three wheelbases. The standard side doors on the Van are 60/40 swing-out. A sliding cargo door is a no-cost option. The standard E-Series offers up to 236.5 cubic feet of rear cargo space, with up to 275.1 cubic feet in extended Van versions. Innovative storage systems are available to best utilize that cargo room. The EconoCargo™ System helps protect cargo with durable panels of high-density polyethylene. This system has a distinct advantage over similar systems sold by the competition: It is insulated, so the interior of the E-Series with EconoCargo retains heat and cold more efficiently, which can provide many more vocational opportunities for food service markets, produce farms and medical supply. The Masterack™ workbin rack system is ideal for customers who must secure tools and parts. It includes fully installed steel shelving, drawers and cabinets, and a full-width safety partition provides work area access from the passenger compartment. The QuietFlex™ Racks and Bins System, similar to the traditional Racks and Bins offering, is made of composite material and provides a quieter, more flexible storage solution. These packages are available at no charge. The E-Series Wagon offers six different seating configurations, accommodating from seven to 15 occupants. A tilt-steering column is standard on all models. The E-Series offers four engines. Three Triton engines (4.6-liter SOHC V-8, 5.4-liter SOHC V-8 and the 6.8-liter SOHC V-10) have a deep-skirt engine block design, high-flow two-valve cylinder heads and low-friction components to enhance reliability and fuel economy. The 6.0-liter Power Stroke diesel engine is a world-class 32-valve turbodiesel with 235 horsepower and 440 pound-feet of torque. When properly equipped, the E-150 Van can tow up to 6,900 pounds, the E-150 Wagon up to 6,500 pounds and the E-350 Super Duty and Super Duty Extended Wagon up to 10,000 pounds. An available Class II/III/IV Trailer Tow Package includes an electric brake controller with tap-in capability, seven-pin trailer wiring harness with bumper bracket and relay system for backup/running lights. For 2006, the 12- and 15-passenger E-Series passenger versions will come standard with AdvanceTrac with Roll Stability Control. Ford's Roll Stability Control is an active stability enhancement system that significantly builds upon existing electronic stability control systems in the market today. To understand the Ford system advantage, consider that conventional stability control systems are designed to help a driver maintain control and avoid fishtailing or a spin out. While some can help reduce the potential for rollover, these conventional systems do not directly measure a vehicle's roll motion or the side-to-side tilting that can occur during an accident avoidance maneuver. Ford's Roll Stability Control rises to the next level by responding to the potential of a rollover, in addition to helping a driver avoid fishtailing or spinouts. Ford's system marries sophisticated electronics and advanced software to mitigate the chances of a rollover during an extreme maneuver. E-Series also offers a full suite of conventional safety features. The driver and right front passenger air bag supplemental restraint system provides protection in frontal collisions. Side-door intrusion beams provide additional protection in certain side collisions. The standard four-wheel anti-lock braking system (ABS) helps provide steering control in hard-braking situations. Wagon XL: Air conditioning, four-wheel anti-lock disc brakes, AM/FM stereo, two 12-volt power points, dual high-back front bucket seats, two three-passenger rear bench seats, tilt steering and interval wipers. Wagon XLT adds: Chrome bumpers, aerodynamic headlamps, six-speaker stereo with CD player, dual cloth captain's chairs, carpeting and floor mats, power windows/mirrors/door locks and speed control. Wagon Chateau adds: Two-tone paint, bright aluminum wheels, quad cloth captain's chairs, CD player, privacy glass, overhead console, keyless entry and running boards. Options include extra sound insulation, auxiliary climate control and packages for specific commercial applications.